Apple continued its iPhone X advertising push on Tuesday with a series of short commercials emphasizing ease of use when it comes to authenticating Apple Pay purchases with Face ID. Part of the company's ongoing iPhone X media campaign, today's ads focus on payments, specifically those performed with Apple Pay and Face ID. In the four spots, each of which runs less than 15 seconds, Apple touts, "With iPhone X you can pay in apps with a glance. Apple Pay and done." Thanks to Face ID biometric authentication on iPhone X, Apple Pay, the company says, is a faster way to purchase everyday items, from coffee to pet supplies. The first ad, "Grooming," starts off with a woman looking at a set of paw prints her dog tracked in from outside. With haste, and exaggerated sound effects, she whips out her iPhone X and orders a batch of grooming supplies from the Jet: Shop Purple app. The Apple Pay payment is authenticated with Face ID, the box arrives and the dog is groomed. A second spot puts a spotlight on in-store purchases as we find a woman browsing through the aisles at her local grocery store. She picks up a few items, pays at the register with Apple Pay, again authenticated with Face ID, and returns home to create a seascape diorama made from fruit. The banana dolphins are a nice touch. The third short takes iPhone X to the cafe, where "Evan" buys a latte and pays on what looks to be a Square Reader. Playing on the coffee shop stereotype, the barista inks "Yvonne" on the cup. Finally, we get treated to a quick hit at the local shoe purveyor, where a woman keen on some kicks selects a minty pair of Air Jordan 1 High Zips in black. She pays for her sneakers at a register equipped again equipped with a Square Reader. 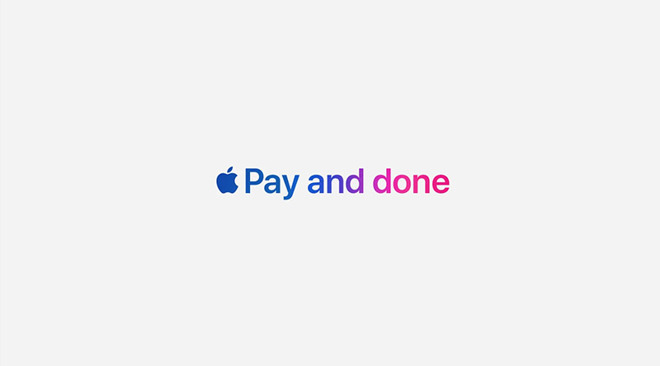 Apple punches the point home with a common tagline for each ad, "Apple Pay and done," with the "Apple" stylized as the company's logo. Today's ads are the latest in a string of iPhone X spots touting the handset's unique capabilities, most of which are tied to the TrueDepth camera array and Face ID. Shortly after the device debuted last year, the company aired a commercial hyping up Animoji, while more recent attempts home in on Apple Pay and Face ID. Packing in an OLED display and cutting-edge depth-sensing technology, Apple's latest flagship is its most expensive to date. The high price point, along with industry scuttlebutt, has prompted speculation that iPhone X sales are not living up to Apple's initial expectations. Last quarter, however, CEO Tim Cook said iPhone X was the top-selling iPhone every week since launch, an impressive metric for a smartphone starting at $999. That pricing is thought to be driving a higher iPhone average selling price, which reached a record $796 over the holiday season.